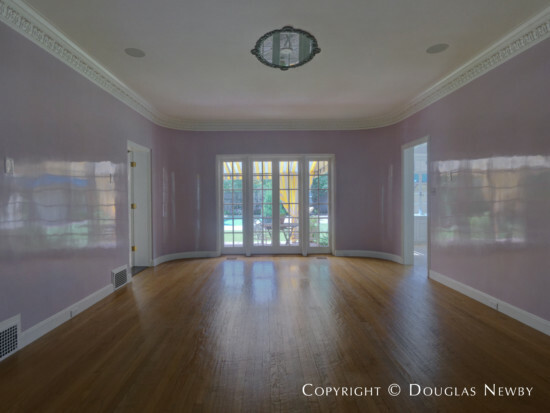 Here is the much loved Lakewood home that expresses the elegance of its 1933 era and the sunlit-filled openness that is so desired by homeowners now. You will enjoy the exquisite historic detail and sleek renovation. View the elegance and modernity of this 1933 architect-designed Lakewood home. 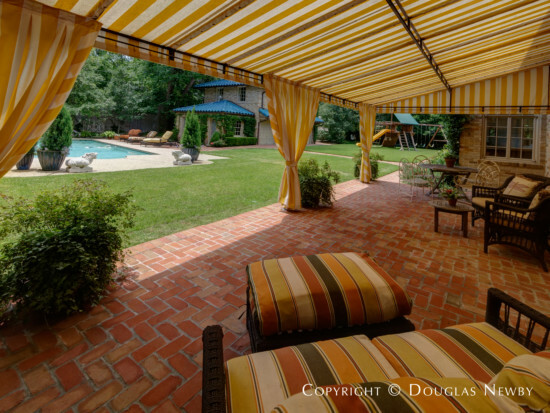 Every prestigious neighborhood usually has one revered home that the neighbors, community and all of Dallas love. 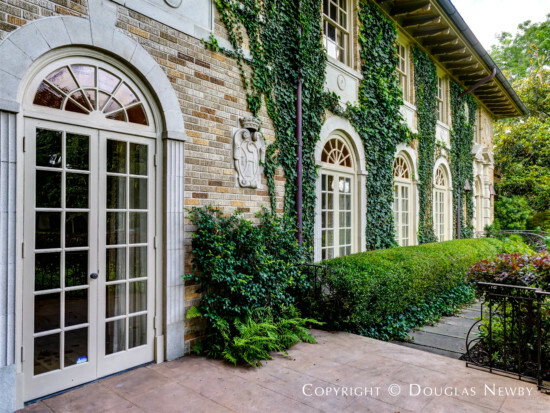 In Preston Hollow it is the Crespi Estate designed by Maurice Fatio on 25 acres. 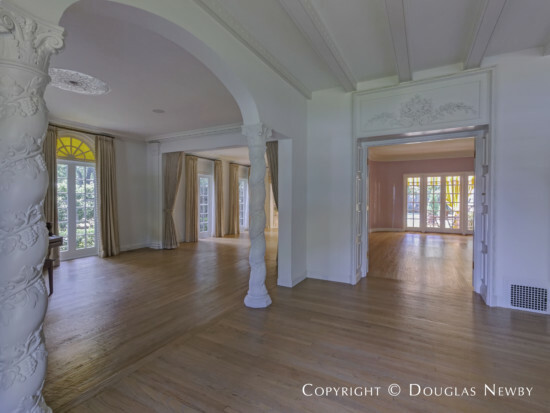 In North Dallas it was the Murchison Estate designed by Dallas architect Anton Korn on 19 acres and was located along White Creek, now known as Glen Abbey. 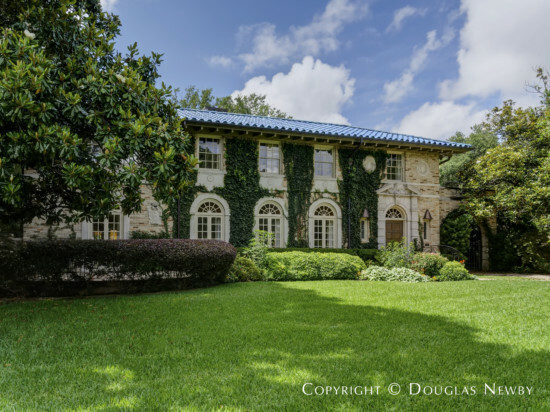 In Volk Estates it is the home designed by Ohio architect John Scudder Adkins at 6801 Turtle Creek Boulevard. In Highland Park it is the Harlan Crow home designed by Anton Korn on seven acres on Preston Road, along Turtle Creek. In Lakewood it is unquestionably the Anton Korn-designed 5,500 square foot home on .578 acres on Lakewood Boulevard, down the street from White Rock Lake. 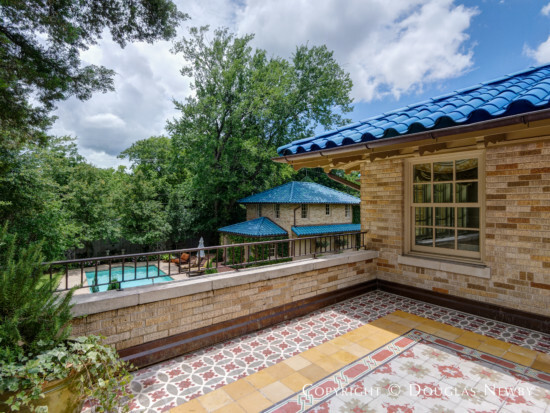 This architecturally significant Italian Renaissance home is distinguished by its blue tile roof, with the new tile created by the original tile maker from the 1930s. Three shades of blue tile are used to achieve the vivid depth of color. The high ceilings and proportions of the rooms opening up to one another in a gracious way create the sense of a home much larger than 5,000 square feet. A spectacular wrought iron banister and ornamental balustrades of the staircase anchor the entrance hall on one side of the front of the home. 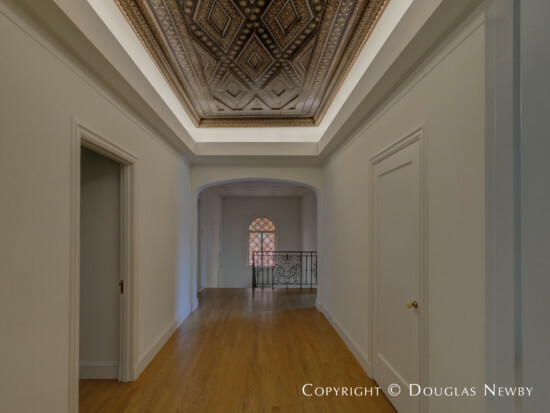 The intricate carved ceiling of the entrance hall changes in the living room to a beamed ceiling with a very refined and subtle motif. Adding continuity to these two open rooms and the music room in the front of the home are the evenly spaced arched floor-to-ceiling windows that wrap around the home, flooding with sunlight these spaces and the informal living room open to the music room. The carved stone detail on the exterior of the home gives a hint of the artistry and refinement of 6676 Lakewood Boulevard. Once inside, your eye is drawn to the carved marble mantel and fireplace surround. And then you discover the gentle carved patterns on the double doors to the dining room. Going through the home is like a visual treasure hunt. You will keep noticing exquisite detail and craftsmanship in these open rooms that are infused with sunlight. Anton Korn tapped into the characteristics of homes that make people happy. From most rooms you will be able to see sunlight in three or four directions. 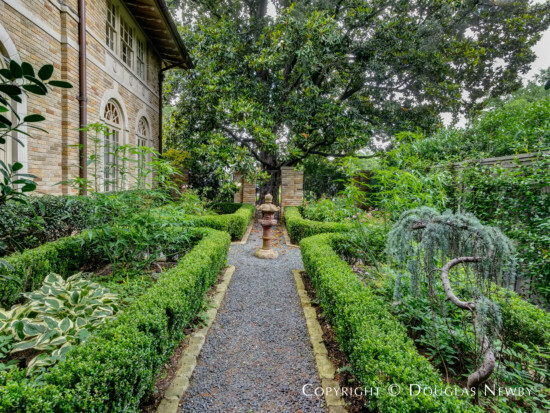 You will be able to hear birds singing in the layered trees arching over the gardens and lawn. The architecture pushes the living space into the gardens with porches, terraces and balconies. French doors in the master bedroom and in the master bath open onto the elevated terrace looking into trees and overlooking the pool. Even from this height the dense perimeter of trees provides a natural visual barrier making the other homes in the neighborhood disappear. Two of the other bedrooms also have glass doors onto a balcony terrace that also has antique tile sourced from Europe. These elevated terraces provide distant views of nature and a glimpse of the copper guttering, copper flashing, and original hand painted pattern on the soffits under the eaves that are freshly restored and varnished for posterity. The spacious master bathroom is furnished with Ann Sacks tile as are the two other bathrooms on the second floor, which also have antique tile floors. 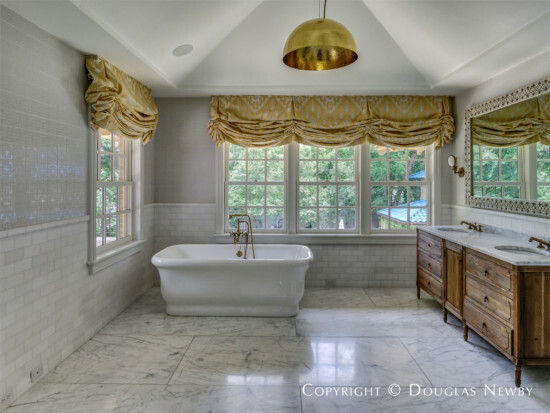 The master bathroom, with remote controls for the window coverings, has a large shower, free-standing Waterworks bath tub, and marble floors, all of which are consistent with the clean-lined elegance of the home and the continuous views of nature. French doors to the terrace accentuate the loveliness of this room and experience. New doors and screens provide a delightful transition from the inside to the outside environment. All second floor bathrooms have heated floors for added comfort even when the balcony doors are open on cool days. The closet, a large room, is part of the master suite with its built-in shelving and cabinetry for hanging a wardrobe. You will also enjoy the refrigerator unit in the master suite service area. 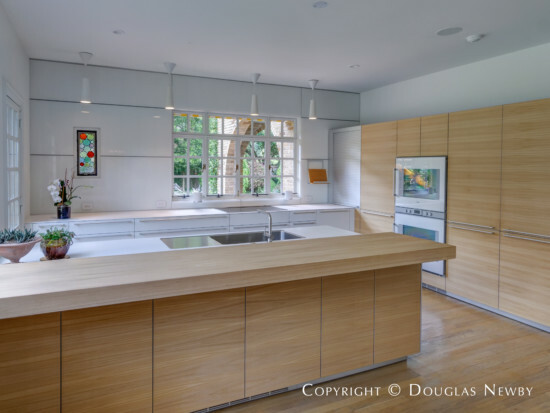 The sleek lines and aesthetic of this 1933 estate home is reflected in the kitchen lined with windows, Bulthaup’s custom and precise cabinetry designed for the space and finished with superior kitchen components. This open kitchen and morning room relate beautifully to the formal dining room, the informal rooms and the exterior living spaces, lawn and pool. Beyond looking fabulous, this is a convenient kitchen for a chef. From the European Miele induction cooktop and the Miele warming drawer and Miele dishwasher, to the Gaggenau double ovens with convection, you will find the finest appliances, including the Liebherr refrigerator/freezer, the Hoshizaki ice maker, SubZero wine chiller and an upright freezer. The outdoor living space extends the interior with a canopied first floor terrace that links the informal rooms of the home to the pool and back yard. The gardens, lawn and pool are easily accessible through one of the many double French doors found in many of the rooms. The canopied terrace extends the interior informal living rooms into the exterior living spaces, gardens, wide lawns, pool and play areas. This large estate lot allows room to frolic, swim, play games, sports, or lavishly entertain. When have you been in a dining room with this much elegance? The Venetian plaster walls gently curve around the corners. 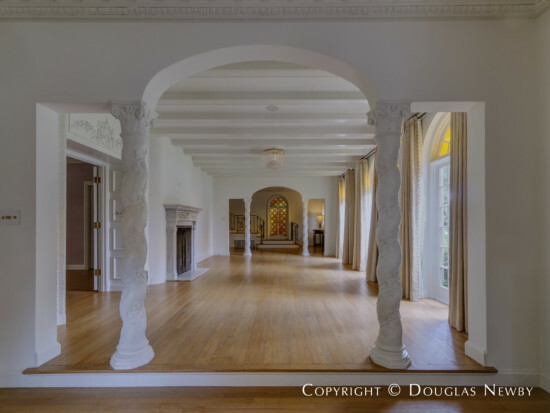 Hand-carved double doors open allowing one to see the series of Palladian windows in the living room or arched openings to the music room or the informal living areas with windows to the formal gardens. This is a dining room that is elegant and inviting. 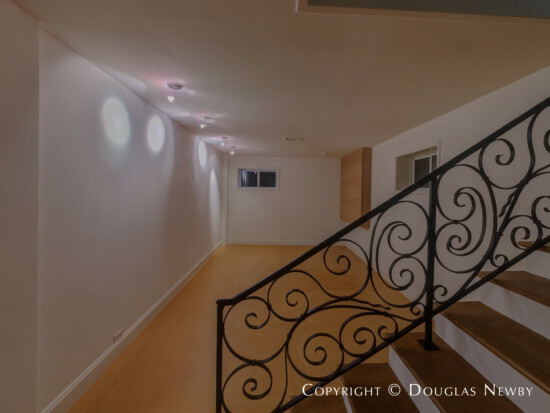 Wrought iron railings lead you to a room that is much more than a basement and is a delightful space that will often be used. It includes an exercise room, half bathroom, laundry room, storage room and mechanical room. Unlike the occasional Dallas basement you may have been in, this space was re-excavated, expanded and new plumbing and mechanical systems consistent with the quality of the rest of the home were installed. 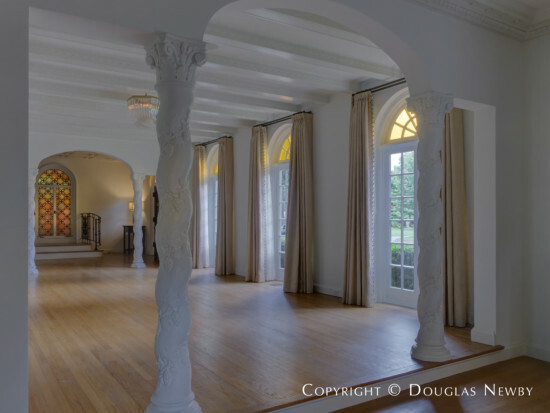 Below grade is where you will have access to the quality mechanical systems, including the elaborate air filter often found in museums and galleries, and the whole house water filtration system. Even the staircases and corridors come across as art. 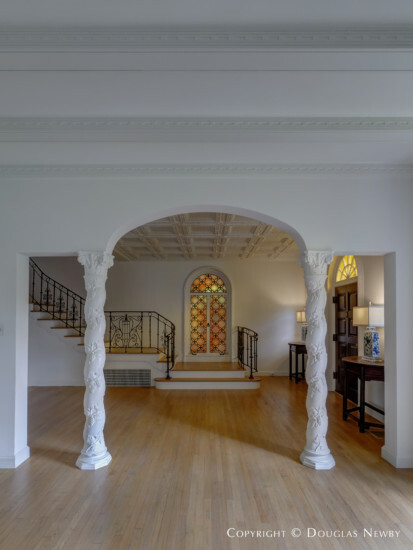 In most houses, whether modern or traditional, builders will load up some ornamentation in a few rooms and as one proceeds further through the home the quality tapers off or disappears. At 6676 Lakewood Boulevard the hand-carved wood and refined ornamentation seldom repeat themselves, but continue through the entire house, providing subtle detail that enriches the home. The current owners took a much loved and admired house and further renovated, enhanced, refined and incorporated high quality 21st century technology, appliances and design to this architecturally significant historic home. These homeowners had the advantage of training at Sotheby’s, living extensively in Europe, and have successfully renovated five homes as ardent preservationists. This home remains their favorite. As environmentalists, air, water and environmental quality was essential in their decisions regarding the home. This led them to install a Cinquartz HEPA air cleaner along with all new HVAC and ducts. The outdoor units were relocated to the area behind the guest house and the interior units to the mechanical room below grade to prevent intrusive noise. Also installed was a Solarhot hot water heater, Environmental Water Systems water filtration, and a Honeywell thermal expansion tank. The hot water is solar thermal with the solar tubes on the second floor terrace of childrens’ bedrooms. In addition, there is a gas heated tankless hot water heater. New gas lines and new, larger sewer lines have been installed in the alley. The plumbing throughout the house has been replaced as has the electrical wiring. A new, enhanced security system has been installed. While the original hardwood floors have been refinished in the living room, new matching hardwood floors have been installed in the informal living room. The gas log fireplace is operable. One of my favorite finishes in the home are the Forbes & Lomax switchplates. These European switches invoke the sleekness and history of this 1933 home. The secret side garden is a treat to discover when outside and a delight to look at when inside. In addition to the garden, the brick patio and walkways have been added as well as the wood fence at the rear of the property, and the brick pillars and wood fence along Pearson Drive. A gate on a track has been added from the alley for the rear parking pad. A new pool pump, mosquito misting system and sprinkler system have been installed.